It's never too late to get up and get moving - and now there's a great way for anyone age 55 and up to do exactly that with the help of Tony Horton himself! 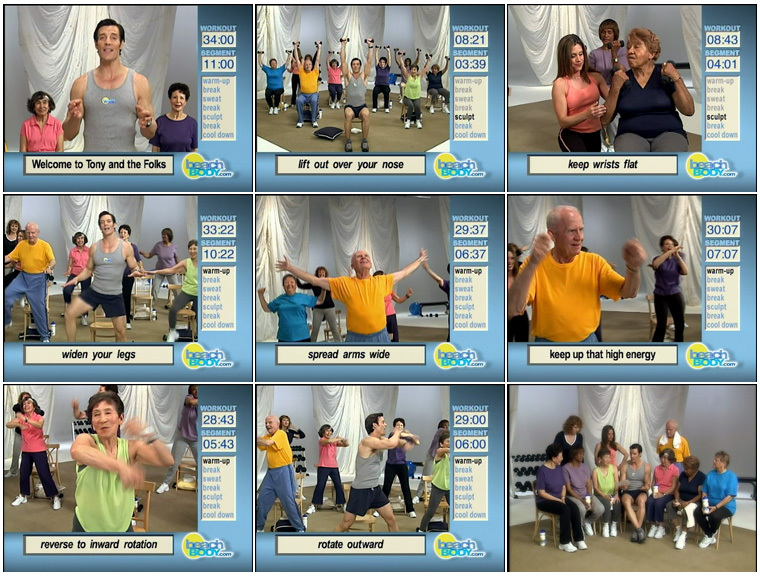 It's Tony & the Folks!a fun half hour of fitness for anyone who wants to ease into a new, fun exercise program. Don't worry about going to fast or too hard, because this program is designed to get your heart pumping and blood flowing with low-impact exercises that are clearly presented in this program. All the moves in this program offer alternate positions to increase or decrease the intensity. It's truly one of the most entertaining ways to achieve and sustain a healthy lifestyle for someone new to fitness. After you experience the benefits of this fun, low-impact workout, you'll get an opportunity to learn Tony's take on maintaining good health and fitness habits in a special "chat with Tony". Recommended for kids age 5575! A small pillow, light weights (even soup cans will do), and a chair are all you need to get started. A portion of all proceeds are donated to Concern Foundation, an independent volunteer organization dedicated to funding basic cancer research. It has helped raise over $23 million for cancer research since its inception.